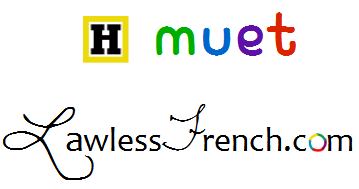 The French h muet is not just silent, but essentially non-existent: words that begin with h muet act as if they begin with a vowel. That is to say that elisions and liaisons are required in front of the h muet, in contrast to the h aspiré, in front of which they are forbidden. Par exemple : J’hésite à lire les histoires. – I hesitate to read the stories. Because hésiter begins with h muet, the elision with je is required. Je hésite is incorrect. Likewise, les histoires is pronounced [lay zee stwar], not [lay ee stwar] as it would be if histoires started with h aspiré. There are more words that begin with h muet than with h aspiré, but when in doubt, check a dictionary. The pronunciation key will include some kind of symbol if it’s an h aspiré, or nothing at all if it’s an h muet.